As a wild bird, the Common Peafowl (commonly known as the Peacock) lives in deciduous tropical forests and feeds in open places such as clearings or cultivated fields. Its diet consists of seeds, fruit, and other parts of plants, as well as small animals ranging from insects to mice. The male's long and colorful train is not the bird's tail but an ornament, composed of some 150 large feathers growing from his lower back. The real tail is short and dull-colored, hidden underneath the train. The female lacks a train, as does the male in winter. Both sexes, and even the tiny young, possess little, fan-shaped crests on the crown of the head. 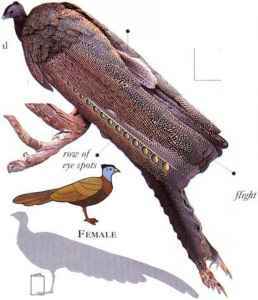 In display, the male raises up his train in a symmetrical fan by lifting his tail. At the same time, he lowers and shakes his chestnut-colored wings, which he reveals when strutting and turning in front of the female. He also utters a loud, far-carrying call. A displaying male will soon attract, and then guard, a small flock of females. The flock remains with him for a few days, during which time he mates with each of them. 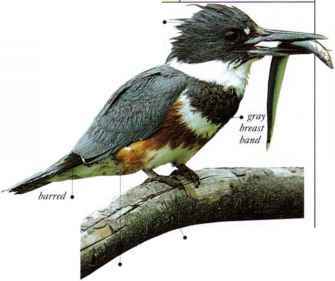 Each female then departs to nest alone, without the help of the male. Both sexes are agile enough to fly up into the higher branches of trees to roost. • nlist A shallow hollow made by the birds, bare or lined with sticks, leaves, and grass, and often concealed in thorny undergrowth. • Distribution Indian subcontinent, including Sri Lanka.